Manchester United ended a dismal derby sequence and piled the pressure on Manuel Pellegrini as his Manchester City side were well beaten at Old Trafford. City, attempting to recover from successive away defeats at Liverpool, Burnley and Crystal Palace, made a blistering start and took an early lead through Sergio Aguero. It was all downhill from then on for the fading Premier League champions as Ashley Young and the revitalised Marouane Fellaini put United in front before half-time. Louis van Gaal’s side never looked like surrendering the advantage as they secured a sixth straight Premier League win with further goals from Juan Mata and Chris Smalling. The victory put them four points ahead of City and firmly on course for a return to the Champions League next season. As for City, this was the sort of capitulation that never reflects well on any manager and Liverpool could narrow the gap to Pellegrini’s side to just four points if they beat Newcastle United at Anfield on Monday. Missing out on the Champions League is the unthinkable scenario for City and Pellegrini, who had won the previous four Manchester derbies – including three at Old Trafford – before his side declined alarmingly after a perfect start. And to illustrate the turnaround in fortunes, it was only just over a year ago that City’s 3-0 win here effectively signalled the end of David Moyes’ United reign and put City 15 points ahead of their rivals having played two games fewer. United are now the team that looks rejuvenated, while City are in serious need of reconstruction as the defensive frailties and fluctuating form that have characterised their season were exposed once more. City can take solace from having four of their last six games at home but their defence of the title is in ruins and the speculation surrounding Pellegrini will continue ,especially if they miss out on the top four. Liverpool captain Steven Gerrard was sent off 38 seconds after coming on as a half-time substitute as Manchester United retained their grip on a top-four place with a vital win at Anfield. Gerrard was introduced for Adam Lallana at the start of the second half with United deservedly leading through Juan Mata’s early goal – but was gone almost as quickly after following up a thunderous tackle on the goalscorer with a reckless reaction to a challenge with a clear stamp on Ander Herrera. It was inexcusable behaviour from a player of Gerrard’s experience, having just been handed the responsibility by manager Brendan Rodgers of getting an underperforming Liverpool side back into the game. Mata emphasised the folly of Gerrard’s red card when he added a second with a sensational volley just before the hour to confirm United’s superiority in a game that confirmed the impression that manager Louis van Gaal is now getting the sort of performances and results he demands. Daniel Sturridge pulled a goal back to give Liverpool hope of an unlikely comeback but the visitors were never seriously threatened again and could even afford the luxury of Wayne Rooney seeing an injury-time penalty saved by Liverpool keeper Simon Mignolet. United built on last Sunday’s impressive 3-0 win against Tottenham to extend their lead to five points over Liverpool, who are a place behind in fifth. 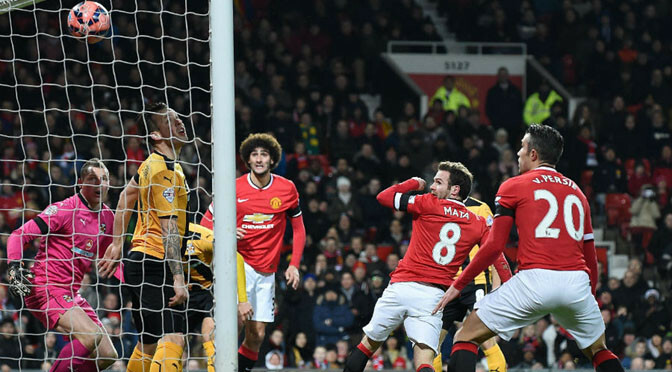 Cambridge’s heart-warming FA Cup run came to an end as Manchester United snuffed out any hopes of another shock at Old Trafford. Juan Mata, Marcos Rojo and second-half substitute James Wilson scored in the 3-0 win which sent United through to a fifth-round tie at League One Preston. Cambridge failed to match the heroics of Bradford and Middlesbrough — who knocked out Chelsea and Manchester City respectively — but it could have been a much different story had Tom Elliott converted a great opportunity after just 50 seconds. Cambridge will not care about that though. The 6,500 fans they brought to Old Trafford — and the supporters they have won along this FA Cup run — were just delighted the team made it this far. And in fairness to the League Two outfit they put up more than a fight in their two fixtures against the 20-time English champions. The 0-0 draw against United 11 days ago will live long in the memory of the club’s fans — as will their trip to Old Trafford, where they came up against a team worth almost £240million. The £1million windfall the minnows have earned from this replay will come in particularly handy to Cambridge, who have an annual turnover of £1.6million. Manchester United beat Liverpool 3-0 at Old Trafford but they had David De Gea to thank once again for saving a number of chances for the Red Devils. Raheem Sterling was the chief culprit for Liverpool as De Gea flung himself in front of everything thrown at him and denied the Englishman shortly before Wayne Rooney latched onto an Antonio Valencia cross to open the scoring in the 13th minute. Just before the break Juan Mata headed a second, but appeared to be offside and United went into half-time 2-0 up. Mario Balotelli arrived from the substitutes’ bench, but could not make the difference as De Gea stood strong to deny Sterling once more. On 68 minutes the Spanish goalkeeper somehow deflected Balotelli’s shot onto the bar and shortly after Robin van Persie took advantage of a poor clearance from Dejan Lovren to make the points safe. De Gea still had time to deny Balotelli twice more though, to rightly claim the Man of the Match award and all three points. With both teams out of form, Gary Neville had predicted this match would resemble the “Dog & Duck versus the Red Lion”, but only one team defended like a Sunday league team in this grudge match. Liverpool’s marking and composure at the back was all over the place and United took full advantage. Rodgers took a big gamble by dropping Simon Mignolet for Jones and starting Raheem Sterling as a lone striker. And the move backfired quite spectacularly. 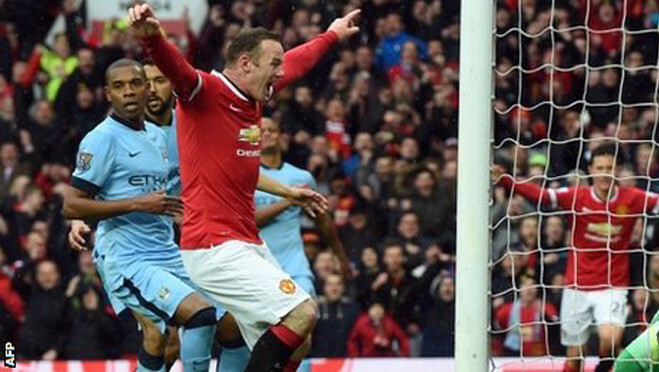 United’s sixth consecutive win moves them to within eight points of Premier League leaders Chelsea. The repercussions for Liverpool are more serious. Rodgers insisted he was the right man to lead the Reds out of the mire before kick-off, but he walked down the tunnel to taunts of “you’re getting sacked in the morning” from the home fans. Rodgers’ team routed United 3-0 here in March. Now they are ninth in the table, some 18 points off the summit. It will not take long for Liverpool supporters’ patience in their manager to run out if they keep performing like this. There was no sign of the impending Liverpool meltdown early on. 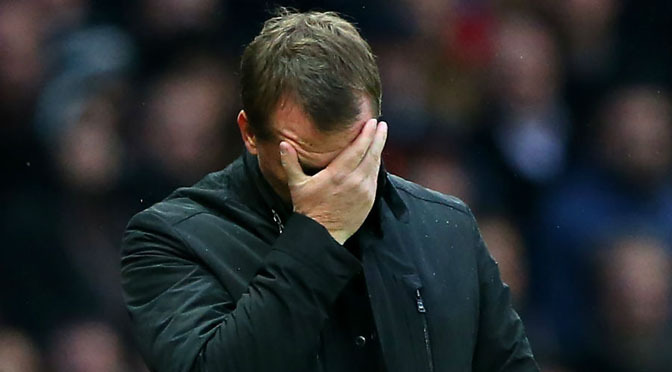 Rodgers’ team pressed high up the pitch and they could not get out of their own half in the opening five minutes. United lacked composure and Marouane Fellaini was the worst offender. The big Belgian could not complete the simplest of passes and he hacked down Adam Lallana to receive a booking. The home crowd groaned as United passed the ball backwards or sideways. Rodgers’ tactical gamble looked to be working at the start. Sterling — playing as a lone striker — caused Phil Jones, Jonny Evans and Michael Carrick no end of problems with his pace. His finishing let him down in the 12th minute when he stole in behind the defence and shot straight at De Gea. Just 25 seconds later Rooney showed his England team-mate how it should be done. Rooney made a late run from deep and he was picked out by Valencia, who nutmegged Joe Allen to give himself time to deliver the precise pass. Jones dived the wrong way and Rooney swept home from 15 yards before he was mobbed by his jubilant team-mates. Liverpool’s finishing let them down three more times before half-time. Steven Gerrard tried — and failed — to beat De Gea from long range and the Spaniard thwarted Sterling again after he turned Jones with ease. Alberto Moreno also broke into the box but his touch was shoddy and Valencia rescued United. Neville must have enjoyed the first half. Some of Liverpool’s passing did resemble that of a pub team. United were putting their lead in danger though with some rash challenges. Jones, Evans and Rooney all went into the book for fouls on Phillippe Coutinho. Rodgers had to replace Glen Johnson with Kolo Toure after the right-back pulled up with an injury. United did not look entirely convincing on the attack, but they still doubled their lead in controversial circumstances. Van Persie flicked Ashley Young’s cross into the path of Mata, who nodded in his fifth of the season. The Spaniard was at least a yard offside but linesman Michael Mullarkey did not flag and the goal stood. Balotelli was booed when he came on at half-time, while Liverpool’s best chances continued to fall to Sterling. The England winger picked up a short back pass from Evans, but could not finish thanks to the calm brilliance of De Gea. 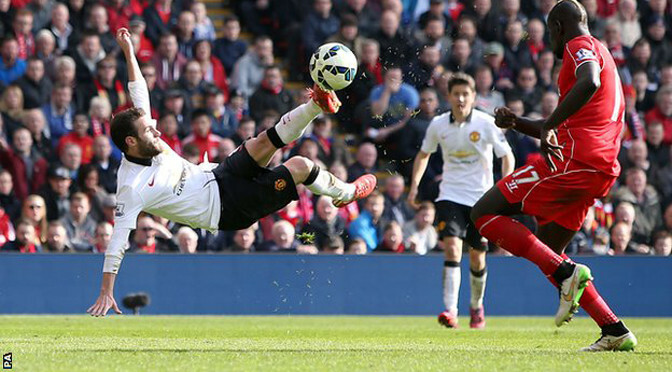 De Gea was United’s saviour again when he tipped Balotelli’s shot on to the bar. Henderson spurned another good opportunity when he headed over from 10 yards. United were far more clinical in front of goal. Van Persie delivered the fatal blow with 19 minutes to go. He will struggle to score an easier goal all season. Lovren had all the time in the world to hook Rooney’s square pass clear, but instead he fluffed it to Mata and he picked out the unmarked Van Persie, who slotted the ball home. Manchester United continued their recent revival with a fourth successive win which strengthens their place in the Premier League top four. The home side led when Marouane Fellaini headed in Ander Herrera’s left-wing cross at the far post. Stoke equalised through Steven N’Zonzi’s low shot, but they slipped to a third straight loss when Juan Mata’s free-kick from the right sneaked in. However, Stoke’s Mame Biram Diouf was twice denied an injury-time equaliser. The 26-year-old Stoke forward, who had an undistinguished spell at Old Trafford earlier in his career, saw United keeper David De Gea claw out his header before emergency full-back Ashley Young cleared another effort off the line seconds later. Diouf was left mystified at the final whistle by his inability to earn a point for the visitors, shaking his head in disbelief as he slowly trudged off the pitch. A draw would have been harsh on United, who controlled the game throughout, but had to rely on a piece of fortune for the winner. Spain midfielder Mata’s set-piece evaded all the players waiting in the penalty area, although team-mate Marcos Rojo claimed he flicked in the final touch. However, United boss Louis van Gaal will not be too bothered about the identity of the goalscorer. The Dutchman breathed a huge sigh of relief as he marched down the Old Trafford tunnel as his team continue to build momentum, despite failing to turn almost 70% of possession into more goals. Van Gaal was unable to call on skipper Wayne Rooney or Angel Di Maria, with the pair missing from United’s squad through injuries sustained against Hull on Saturday. And for large periods, the home side sorely missed the pair’s attacking guile. But Stoke rarely looked like ending a dismal run of 11 successive Old Trafford defeats – until the late drama involving Diouf. Old Trafford lost some of its famed ‘fear factor’ last season as United slumped to seven home Premier League defeats in a terrible first campaign following Sir Alex Ferguson’s retirement. That aura of invincibility appears to have returned under Van Gaal, whose team have taken 19 home points from a possible 21 since defeat by Swansea on the opening day. Potters boss Mark Hughes indicated his side would not be afraid to “have a go” at United, but they rarely looked like carving open a makeshift home defence until stoppage time. United controlled the tempo and deservedly led when Spanish midfielder Herrera was allowed too much time and space to pick out Fellaini, who outjumped Erik Pieters to powerfully nod in. Hughes was furious with the space that his side allowed Herrera, but his demeanour changed when N’Zonzi calmly guided a 20-yard shot past De Gea with Stoke’s first attempt on goal. But Mata’s intervention moved United within two points of second-placed Manchester City, who travel to Sunderland on Wednesday, while Stoke remain four points above the relegation zone.